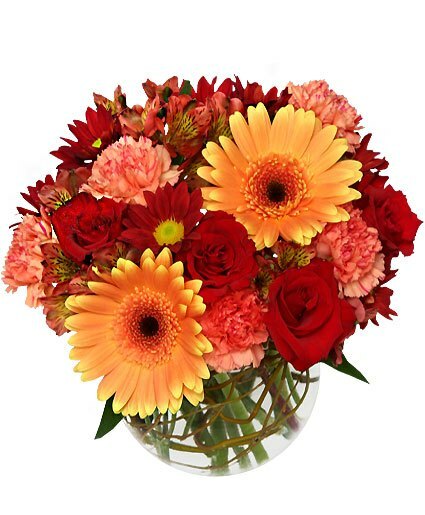 Red roses fall upon grebrea daisies and clouds of carnations to create a Hot & Spicy sensation of friends, family and fall. Send an awesome autumn flower arrangement to someone you know and love and celebrate the season together. This arrangement is designed in several different colors and styles according to your special needs. Each design is custom, so please give us a call to see what is in season. We are known for going out of our way to make your flowers special! The dictionary defines spicy as having the quality, flavor or fragrance of spice. OALD defines spicy as having a strong taste because spices have been used to flavor it. CALD defines spicy as containing strong flavors from spices. If we use these definitions then spicy food may or may not be hot depending on the spices used. Having said that, because many spices are hot, spicy is considered almost synonymous with hot. Therefore, there is a difference between the two but it is slight.